Wallpapering Fog: Just stop it. There's no such thing as "Data Science". Just stop it. There's no such thing as "Data Science". I haven't had a good rant for a while. Rants are what blogs are for. Here comes a rant. The term "Data Scientist" is getting well out of hand. I'm seeing articles all over the place with titles like "What is a Data Scientist?" and "do you need one?". Data Scientists are what happens when marketing people and journalists spot a trend that's been going on for ages, but decide to act like they've just discovered fire. I should probably decide to call myself one and then double what I used to charge for work, before I was a Data Scientist. I'm not doing that though, I'm ranting on a blog. 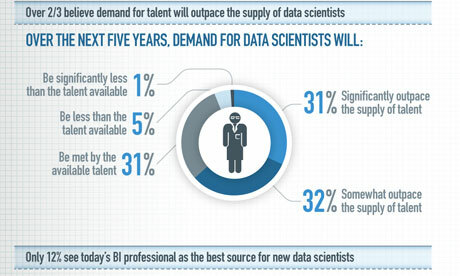 "Data Scientist" is a tautology. You know what they call people who use data to do science? People who purport to be data scientists should be willing to adopt full scientific method. Let me and others peer review their work, and we will see how good it is. Brilliant. Does that mean confidentiality renders true [Data] Science in any business context, dead in the water? Think it probably does. There's a post in that... Thanks for the idea!